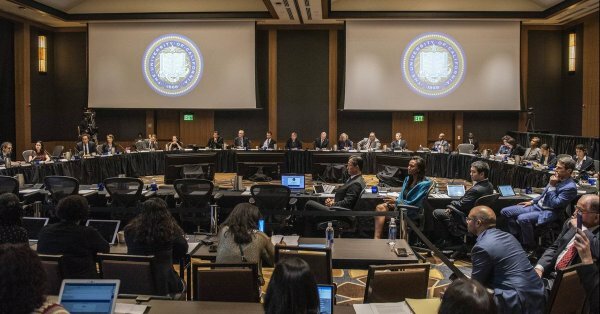 The UC Board of Regents approved a budget of $9.3 billion to increase overall undergraduate admittance by 2,500 in the upcoming year at its bi-monthly meeting on Nov. 15. The budget is part of a four-year plan to provide increased need-based financial support for students, increase enrollment, and improve on-campus facilities. The UC administration aims to award an additional 200,000 undergraduate degrees by 2030. Currently, roughly two-thirds of all UC undergraduate students complete their studies within four years, though the goal is to increase the number to 76 percent by 2030. UC Regents discussed other issues, such as college accessibility. Both UCLA and and UC Berkeley have nearly reached their maximum capacities at 44,947 and 41,910 students respectively, though UC Riverside and UC Merced still have the capacity to grow. Enrollment increases at UC Merced, in particular, are salient to UC enrollment rates across the board, as the campus has the greatest number of first-generation and low-income students of all UC campuses. In addition to increasing the overall budget, UC representatives also plan to lobby the state legislature to allow students to apply Cal Grants toward summer courses to allow students to graduate on time, if not earlier. Increased rates of four-year degree achievements are hoped to stimulate career developments while increasing available space for incoming undergraduates. Sources at education industry analysis group Education Dive have reported that the budget plan included a request for $277.6 million in state funding — roughly one quarter of which would be allotted to fight tuition hikes. The new budget plan coincides with California Gov.-elect Gavin Newsom’s aspirations for improved state education. While hosting a campaign rally at Sacramento State University, Newsom stated his objective of creating a “new energy around higher education”. Newsom has denounced tuition increases in higher education, even going so far as to propose a ‘Cradle to Career’ education pledge in which two years of tuition-free community college will be available to California students. The UC Regents’ support for the proposed budget plan increased after administrators from UC Berkeley and UC Davis described the need for funds to repair outdated electrical systems, leaking roofs, and architectural flaws that could prove dangerous in the event of an earthquake. The Los Angeles Times has reported that the new budget has adjusted funding for enrollment growth to 86.3 million, increased academic support to $60 million, and administrative staff and faculty raises to $137 million. Funding for construction and facility maintenance is set to increase to $115 million, while $119.8 million will be directed to faculty benefits, retirement packages, and similar costs.